GRAND RAPIDS, Mich. – SpartanNash will honor current members and veterans of the Armed Forces this Veterans Day by offering an 11 percent discount on all eligible products in its more than 135 corporate-owned retail stores in eight states. 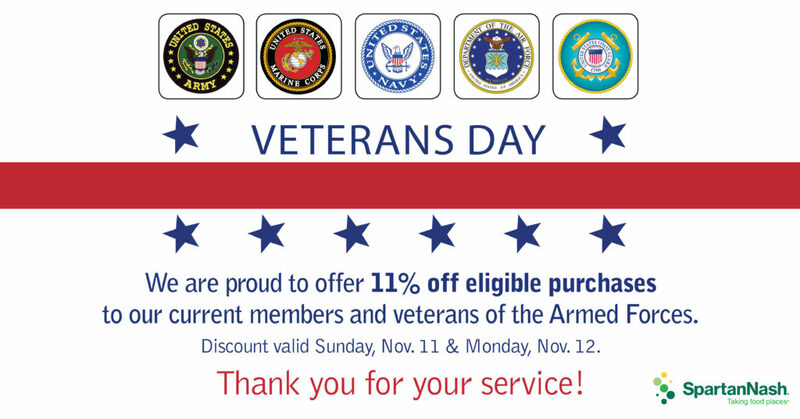 The 11 percent discount will be offered Sunday, Nov. 11 and Monday, Nov. 12. SpartanNash stores with flag poles will hold flag-raising ceremonies at 11 a.m. on Nov. 12, which are open to the public and led by local veterans groups or Boy Scout troops. SpartanNash proudly employs more than 700 self-identified veterans and is committed to hiring, training and retaining current and former members of the Armed Forces and their family members. Because of this, SpartanNash was named a silver-level Veteran-Friendly Employer by the Michigan Veterans Affairs Agency and a Military Friendly® Employer by VIQTORY.